Here is a great pair of 906 mittens. In Upper Michigan we think that's God's area code! The palms and cuff are black, as there is black in the teal pattern of the mitten. 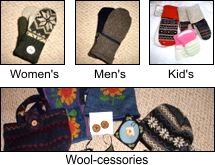 They are lined with high quality winter fleece, like all of our mittens. Each pair of state mittens comes with a tiny diamond and instructions on how to put it on your favorite spot in Upper MIchigan.